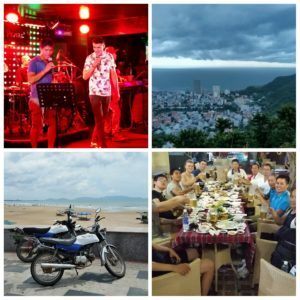 After being spoiled for a few days by Vinh and his family it was time for us to explore Vietnam on our own wheels. 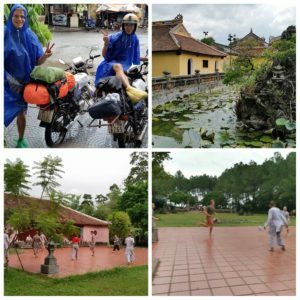 In three weeks we rode our motorbikes 3,000 km from Ho Chi Minh City to Hanoi. 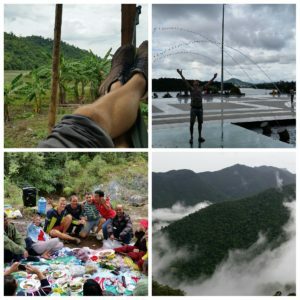 Here’s a recap of the places we visited, the people we met, and the things we did. First stop after HCMC was the crude oil port of Vietnam: Vũng Tàu. 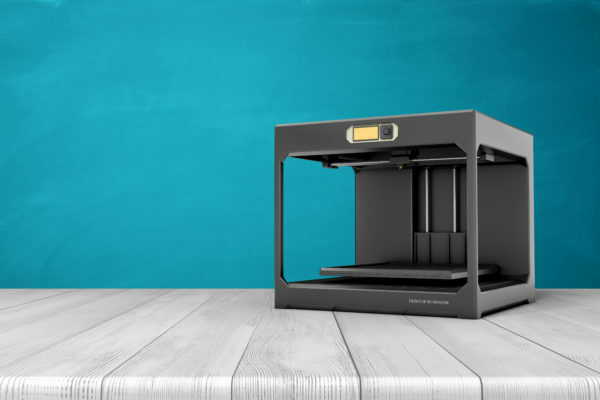 We went here on recommendation from Vinh, who came along with us as he regularly goes here for business. So we still had our tour guide, who took us along on some “business trips” (read as: fancy dinners and playing soccer with his clients), and showed us some great lookouts over the city. Vũng Tàu used to be full of expats, but because of low oil prices, the city is now somewhat emptier. Go there and help them out! It’s not touristy yet and well worth it. From Vũng Tàu we rode 180 km further to Mũi Né. A great thing about Vietnam are the cà phê võng; where you can enjoy your coffee whilst hanging in a hammock. A great way to recharge for the rest of the journey and relax your derrière. Mũi Né is famous for its white and red sand dunes. 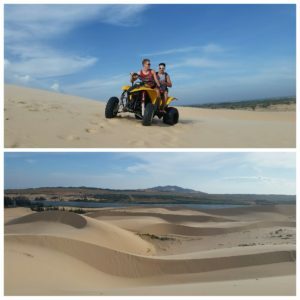 We raced through the white dunes on a quad, which was pretty damn cool! At the red dunes the thing to do seems to be sliding down the dunes on a little mat. Of course we wanted to try that, but it turned out to be a bit of a bummer compared to the furious quad at the other dunes. Another 180 km north-west brought us to Vietnam’s central Highlands: the beautiful city of Đà Lạt. With a significantly colder climate, the landscape is much different to what we have seen so far. Beautiful flowers, pine trees, rivers, and a lake, showed us a different side of Vietnam. During our days in Đà Lạt the Mid-Autumn Festival took place with several associated festivities throughout the day, such as the famous Dragon Dance. During a sightseeing tour on our motorbikes we explored Đà Lạt’s nature, with the stunning Elephant Waterfalls as the cherry on the cake. Not to forget the group of Vietnamese whom we did karaoke with in the middle of nowhere. Because why wouldn’t you bring a karaoke set on your remote picnic? We descended 1500 meters again and rode a beautiful road back to the coast, sadly through a constant rain. Nha Trang, basically a Russian city within Vietnam, is booming with 20+ storey hotels. The influx of Russians is no wonder. A comrade we met at the bar came on a two-week package deal with a half pension for 600$. 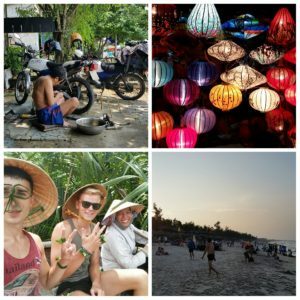 Off the regular tourist track we found Quy Nhơn, where Google Maps showed us a “hidden beach” we wanted to reach at all costs. 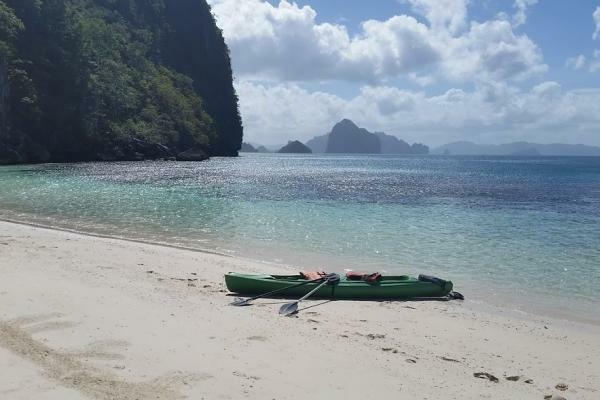 After riding around for two hours we ended up in a small fishing village and learned, that the road is deemed unsafe and the beach is best reached by (their) boat. After a bit of haggling we found ourselves on a tiny fisher boat (53 years old) on the way to the beach! The fisherman (only 47) showed us the remote beach, and took us further into the ocean to a great snorkelling place filled with corals and pretty little fish. The morning before we left Quy Nhơn we heard about the island Lý Sơn. With the freedom of our motorbikes we decided to check it out. With the luck on our side, we arrived at the pier 14:10, and the boat left at 14:30. We quickly bought a ticket, loaded the bikes on board, and without really knowing where exactly we are going, we were on route to an island. Upon arrival we saw that it’s not a blue water and white sands kind of beach, but a more concrete city with big hills and loads of garlic fields, the pride of the island. 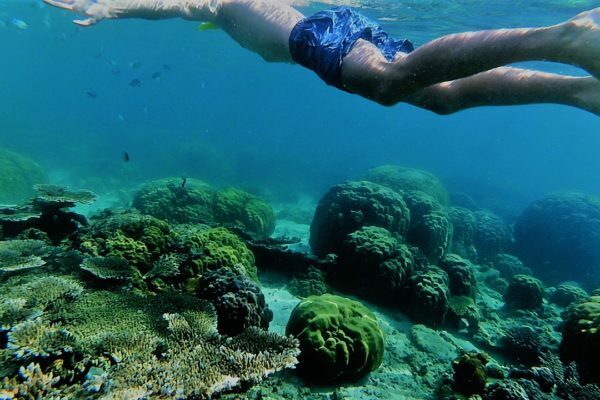 Despite the lack of beaches, the island boasts marvellous cliffs, and the snorkelling above the rocks and corrals gave us a sight of much fauna including humongous jellyfish. 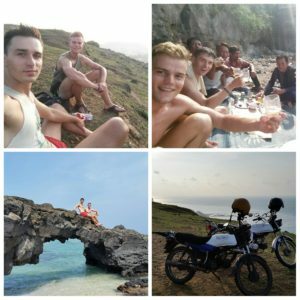 Being the only European tourists on the island we ate and drank with the locals, and learned again a little bit more about Vietnam. On our way to Hội An my flat tire forced us to make a little pit stop. We praised ourselves lucky that this happened 10 meters from a mechanic, and not somewhere in the mountains of Đà Lạt, with no one around. Hội An, one of my favourite cities when I visited Vietnam two years ago, still deserves a place in the top three. The relaxed vibe, authentic town, and chill beach, are well protected from mass development being a UNESCO World Heritage Site. Whenever we told people that we are going to explore Vietnam on a motorbike, the famous Top Gear episode was brought up. Where Jeremy, Richard, and James purchased their wheels and took them from HCMC north, with the “Hải Vân Pass” being the absolute highlight. We watched this episode, which is actually a pretty accurate description of our experience on the bikes in Vietnam and got really excited for this Pass. On our way from Hội An to Huế is was finally time to make this particular ride. Alarm at 06:00 AM, tightened all the bolts, optimized tire pressure, filled tanks to the top, we were all good to go! When we climbed on the road toward the pass, the tension was rising. twenty minutes later, after a descent, we checked the map to see if the best was yet to come. Wait, was that the pass already?! Yes, the view was pretty, but certainly not worth the hype. Views from Đà Lạt and on the Ho Chi Minh Road are far superior. The rest of the ride to Huế was a rather chaotic and dangerous one. I had a very near miss with an “Easy Rider” (or rather a “Death Rider”, as we call them), a company that takes tourists around Vietnam on the back of a motorbike. You’d think that they would at least pay a little bit more attention when crossing a road. But just like the rest of the traffic participants, they just go without looking. When we arrived in Huế, luckily in one piece, we checked out the famous citadel. Hué was the capital city of the Nguyen Dynasty for 140 years, until the administration shifted to Hanoi. We ended the day in the Thiên Mụ pagoda where we played a little football tournament with the young resident monks. The following day we headed up further north in the pouring rain. Just after we left I had again a flat tire, and this time the whole inner and outer tire needed to be changed. This took some time and at 12:30 we finally sat on the motorbikes again. What followed was a 180km route through an amazing scenery, but also through heavy rain. By the dusk we still hadn’t reached our destination, and so we continued through the dark mountains looking for a place to sleep. Totally soaked and exhausted we arrived in Khe Sanh, which played an important role in the Vietnam war. The plan was to only stay here one night, but we soon learned that Huế already flooded, landslides blocked the road further up north, and more rain was coming our way. After three days in Khe Sanh, the weather finally cleared up and we could continue our journey to Phong Nha. My motorbike still didn’t fully recover from the rain, and after a kilometre of the journey, the engine refused to run (the CDI was KO again). 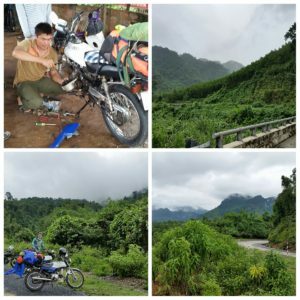 Good two hours at the struggling mechanic and we were back on the famous Ho Chi Minh road, which runs along the mountainous spine of Vietnam. This road is a great relief from the busy highway we’ve mainly ridden on. Along the road we met some fellow bikers and continued our journey with Damon and Simon. Phong Nha is famous for the world’s largest cave, which costs USD 3,000 to enter. 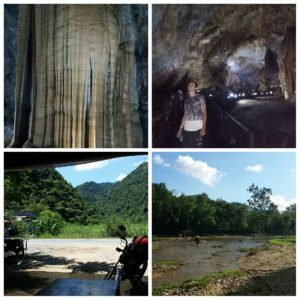 Obviously we didn’t do that, but we did visit the Paradise cave, which owns it name to the spectacular stalactites and stalagmites and other nature’s sculptures. Together with Damon we rode another 270 km closer to our end destination Hanoi. Another beautiful ride on the Ho Chi Minh Road with a swim stop at a river. From Tan Ky only 300 km remained to Hanoi. A tremendously long ride on the bikes, especially the last part through Hanoi, where 5km took us well over an hour. Our time in Hanoi was limited, so we had to sell our bikes. Fortunately, a Dutch couple was so enthusiatic about them, that they had bought them even before we managed to get the baggage off. 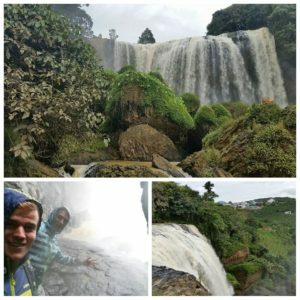 They are planning to take the Flo-Bros across five countries, so we wish them a lot of luck and minimal maintenance costs! We celebrated the sale together with the Dutchies and Damon in a bar in Hanoi. 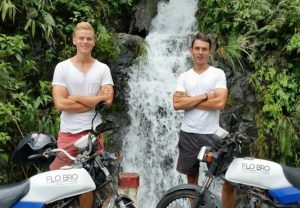 And not just that, we also celebrated that the Flo-Bros took us 4300km through Vietnam and Cambodia without any accidents! Check out the Travel Blog page for a detailed map of the places we visited and more pictures.